If you develop software as a profession, then you know what it is like to spend a good part of the day in front of a monitor. Setting things up to maximize both comfort and ease of use can have a huge impact on productivity. We do a lot of different things here at RainyDayMagazine. Over time, we have settled on different setups for various tasks (image/video editing, web page creation, etc…) which help us both to enjoy what we were doing and to do them comfortably. 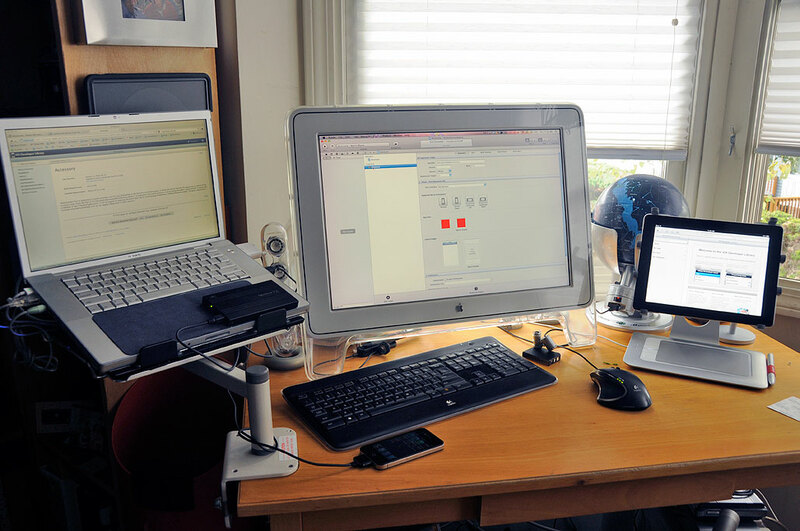 When we go into iPhone-app development mode, the three-screen setup is our preferred layout. The configuration consists of a 15″ Macbook Pro laptop, a 21″ Cinema display, and the iPad (a recent addition). We use a laptop instead of a desktop machine so that we are not tied to the desk should we want to write code outside on the back deck. The large screen is because we often have many files open at the same time. The bigger screen really makes it easier to shuffle things around. We also found that the smaller laptop screen is perfect for reading the documentation. The recent addition to the setup is the iPad. This third screen is perfect for quick internet searches, emails, and other light-weight activities. Having the iPad meant we don’t have to disturb any of the windows on the development system just to deal with emails and such. Sometimes a topic requires a bit more indepth reading or research. We can just grab the iPad and read it on the couch. Everything is backed up to an external SSD. We chose to use an SSD because they are fast and they have a very low failure rate. The SSD also contains a minimal, clean, and bootable system with a complete development environment installed. A clean system is helpful because there are some debugging situations where you just want as little extraneous stuff around as possible. The best way to do that is a minimal system.